Today is my 4-year anniversary as a full-time missionary with Family Missions Company. I thought of several ways to celebrate/give thanks only to find myself overwhelmed with all the possibilities. However, after Mass this morning, I felt the Lord gently reminding me to not worry about planning anything but to just leave it all up to Him. With His Eucharistic grace, I agreed. 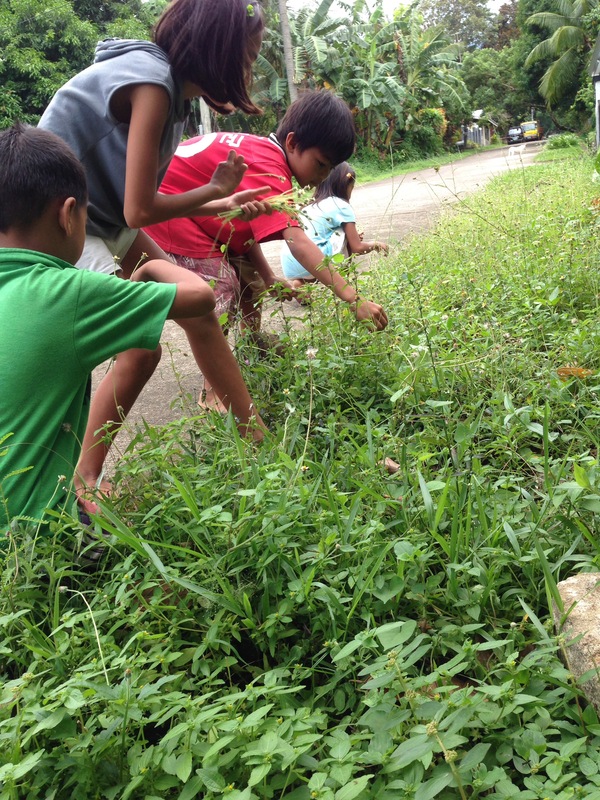 Shortly after returning home, I noticed a group of children waiting outside for me. I invited them in and shyly they entered the cottage. The two girls kept hiding something behind their back and were reluctant to show me. Instead, they first asked for my student companion, Teresa, whom they referred to as “ate ‘Say”. 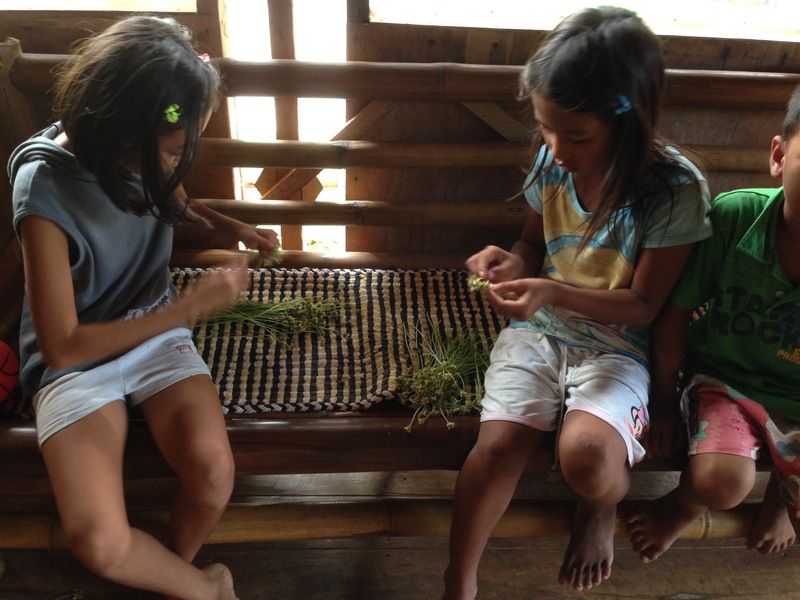 When Teresa finally joined us, both girls slowly presented us with beautifully weaved crowns which they had hand-made out of freshly-picked weeds. 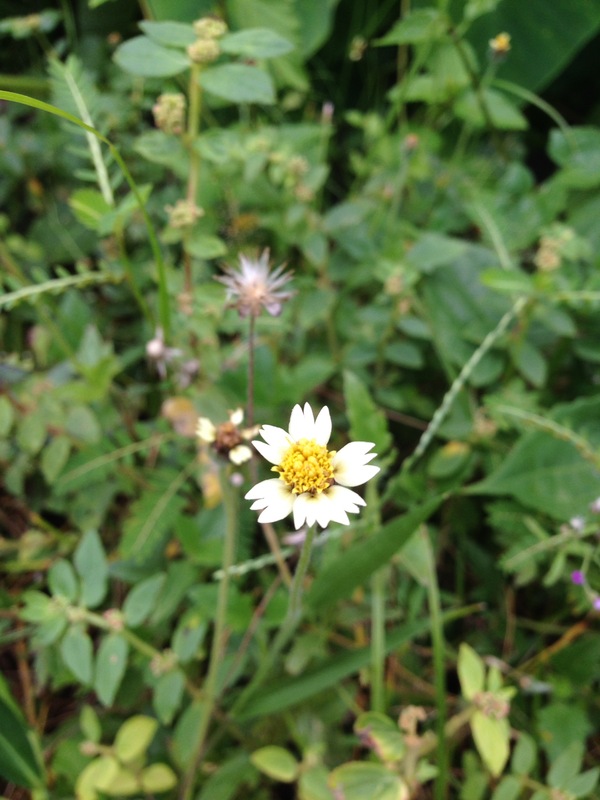 Weeds?? Who would’ve imagined that they could be made into something so beautiful? “Who asked you to make this? Was this for a school project?” I asked. To our surprise, no one had asked them; on their own they just felt inspired to make us these precious gifts. How timely that these girls visited and gifted us with such beautiful creations today of all days. Only God would’ve inspired them to do so… It’s silly how I always think God wants me to do something for Him when in actuality it is HE who is always and already doing something FOR me… to purify me, to sanctify me and to bless me. Thus, I can only appreciate this morning’s visit from the children as God’s way of greeting me, “Happy anniversary, my beautiful beloved.” I may be like the ugly weed but in His loving hands I can be made beautiful. I’m overdue for a blog update but here’s an interim solution for my long-delayed entry. Thank you to all of those who have been donating towards the Camiguin College Mentorship and Scholarship Program! Your donations are doing so much good. Of the 14 students currently being sponsored, 7 are pursuing degrees in the field of agriculture. You might be thinking: “Agriculture?? Why?? How is that going to help them get a job? ?” The truth is that the options for majors are very very limited on Camiguin Island. Moreover, our program’s PRIMARY goal has never been about securing a future for these kids on earth but in heaven! HOWEVER, I do care immensely about these kids and their future careers too. And apparently, so does God! Recently, He gave me a small glimpse of what He has in store for these kids in the near future! In so doing, He reminded me that He knew what He was doing when 2.5 years ago He inspired these kids to take up agriculture and when He moved me and my team with compassion to agree to financially sponsor these students. 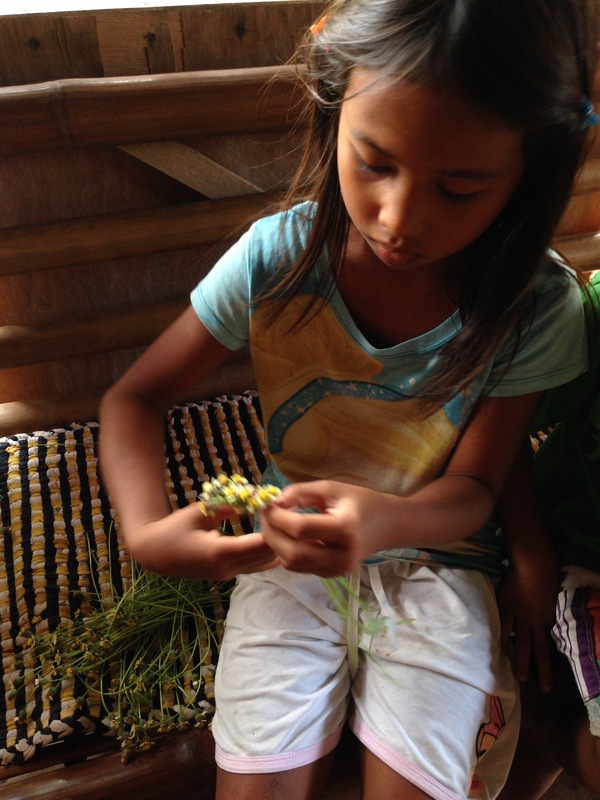 This past week, a few of the students were able to apply some of their learnings from the last 2.5 years of schooling to help Casa San Pio Pilgrim’s Inn and Apostolic Farm which has seen an infestation of scale insects on 100 lanzones trees. Here are pictures of the students harvesting beetles from our little island (with permission from the Dept. of Agriculture) and applying them to the lanzones trees terribly infected by scale insects on the mainland! The job of the beetles – kill the scale insects which are killing the lanzones trees! Casa San Pio, a favorite haven of mine since my first year as a missionary, has also become dear to the students after we recently spent 8 days there on a retreat. It should be noted that the students’ efforts were due neither to a school requirement nor a request from Casa for help. Rather, the students themselves recognized the need. After being blessed by the retreat experience at Casa, they wanted to give back by sharing and applying what they’ve learned in school. In return for their kind service, they got to return to their beloved Casa with their travel expenses covered along with free lodging and meals. And for these simple island kids, that’s already a lot! For me, I saw how God can use my students’ training and education for their own good and the good of others. Indeed, God knows what He is doing and is preparing a “future full of hope” for my students. Perhaps one day He will provide some of them with an opportunity to work for a place like Casa San Pio. Undoubtedly God will do His part in making sure that these kids will be ok after college and even in the life to come. The kids, with their school work, and I, with my missionary obligation, will need to do ours. 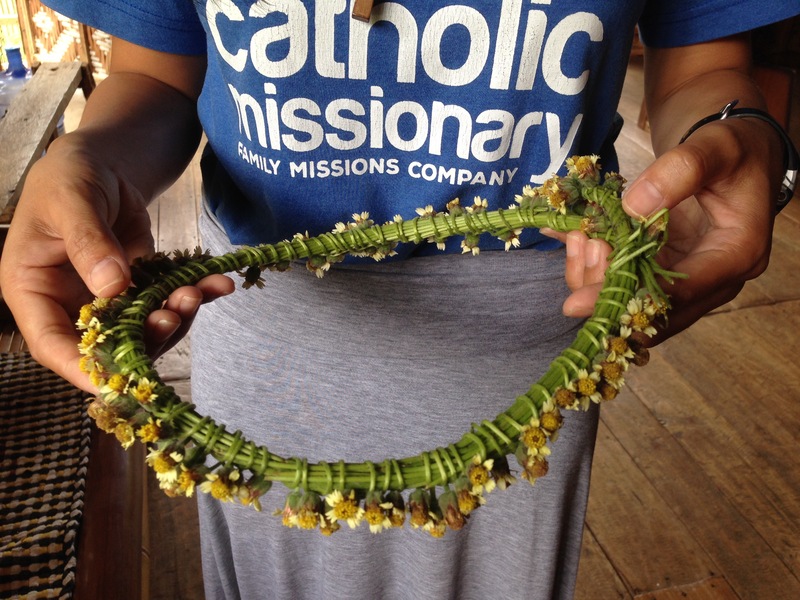 My mission team and I live and work among the poor on Camiguin Island, doing all we can to meet their material needs (food, medicine, housing, etc.) as well as their emotional and spiritual needs. One of our primary focus is our educational sponsorship program. We financially sponsor 22 students in four different colleges. These students come from impoverished families, many of whom struggle to earn enough money for food and other necessities, making higher education a luxury which they could never afford. Our dream is to provide these young men and women with the opportunity to continue their education and ultimately to help raise their families out of the cycle of poverty. In addition to sponsoring their education, we also meet regularly with these students, mentoring them as they mature into Christian adults. Many of them come from broken homes and have experienced abuse or personal loss. Since we first began this program a year and a half ago, we have witnessed tremendous growth and healing in the students’ lives. We work with our students to help them discover and grow in their particular charism (gift) which is meant to build up the body of Christ (Ephesians 4:7, 11-12). Pictured here is one of our students sharing her incredible gift of preaching. The majority of our students receive full sponsorship, covering their tuition and academic fees as well as food and transportation expenses. A few of the students receive only partial scholarship to cover their tuition and additional expenses on an as-needed basis. One student’s full sponsorship costs $350 per semester. 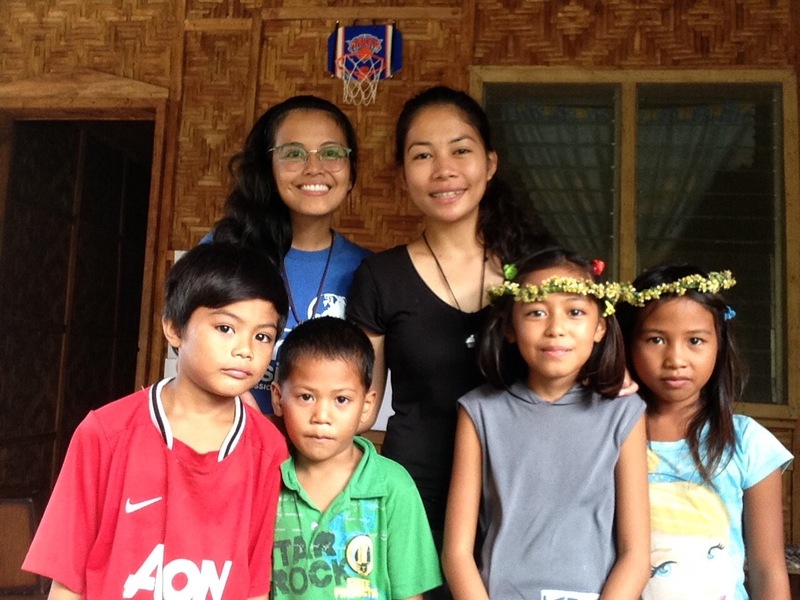 Our goal is to raise $5,700 per semester to cover the cost of sponsoring these students. All of our funding for this mission comes from individual donations. Our organization, Family Missions Company, is a 501 (c)(3), so all donations are tax deductible. Please help us make the dream of continuing education a reality to offer a brighter future to these young men and women. If you would like to donate towards this program, you can write a check to Family Missions Company and mail it to the address below. Just write “Camiguin College Fund” under the memo. Alternatively, you can donate online by visiting my fund page at http://www.joannegarcia.familymissionscompany.com/ Remember to write “Camiguin College Fund” under the comments box. Thank you and Gob bless you! God is so faithful. He blessed my departure from the Philippines 2 months ago with both the sacraments of the Holy Eucharist and Confession within the same airport. Today, of all terminals, he will be flying me out of terminal 4 at New York’s JFK airport which houses a Catholic Chapel. I have painfully longed for an extended time of prayerful silence before I step out into missions again. Attempts at a silent retreat during my last week failed but in my last few hours before taking off, Jesus grants me His most humble Eucharistic company. Praise you, Lord. Update: I met a young man named Romelo here. He came in, turned off the lights, sat in the priest’s chair and put on his headphones. Covered by God’s gift of humility and gentleness, I spoke to him about the holiness of the place and especially of the sanctuary. Romelo is not Catholic and practices no faith yet he respectfully listened and moved to a different seat. Then the Lord inspired me to speak about what/who is reposed in the tabernacle as Romelo listened intently. As he slowly turned to go back to his business, he commented – “interesting.” Then shortly after, he leans back, “can I ask you something… what makes you believe in your religion?” His question took me aback but sensing his sincere curiosity, I would answer him with a very short testimony of how Jesus finally became real to me after 27.5 years. He then thanked me and continued his business listening to music. He would later fall asleep in his chair. Of all chapels… the Lord led him into this one today… at the same time that he brought a lowly missionary evangelist. Romelo wakes up and hurriedly gets up; he’s late to work. As he passes me, I get up and take his hand. I tell him to come back again because of the one here who calls him and loves him. He leaves but not without thanking me. He would be the second man that I would meet today and tell about Jesus. First was my airport driver, Douglas. I will probably meet someone else on the plane… someone whom Jesus desires to know of his great love. I’m tired, hungry and sleepy; in need of more personal prayer time and reading; and wanting to avoid conversations. But Jesus who thirsts for souls will make a way. Just as he did with both Douglas and Romelo who both initiated the “questions” and were open… He will do the opening. I don’t even need to do anything… but just show up… and speak what I know and believe: In Jesus does our heart find infinite love, mercy, peace and healing. We won’t see each other anymore. I’m lonely… I miss you… I love you. For many years my grandmother often spoke these words after she moved back from the U.S. to the Philippines and especially after my grandfather died. Whenever I heard it, my heart would long to return to the Philippines just to see her and bring a smile to her face. And I did – once in 2007 (just in time for her 91st birthday) and again in 2008 (with my siblings). After my conversion to Jesus Christ in 2009, I wanted to see her again with the hope of praying for Jesus’ spirit of peace and comfort to descend upon her and carry her through her final years. I had wanted to visit her many times for this reason but life, work and finances prevented me. I never imagined that it would take God’s radical intervention for this longing to be realized – so radical that I had to become a missionary to the Philippines! 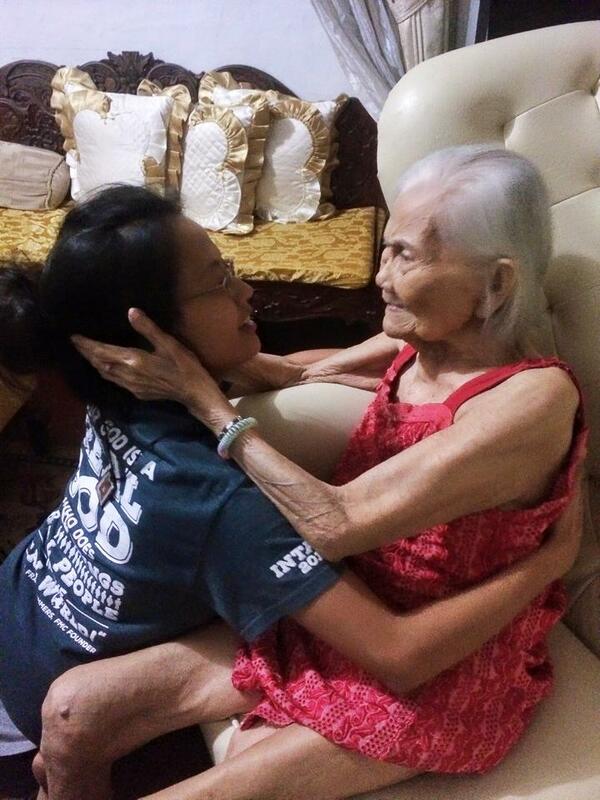 Anticipating the busyness and demands of mission life, I didn’t think I would actually see my lola (grandmother in Tagalog)… at least not until November/December when my first year in missions ends. God, however, had others plans. Through Fr. 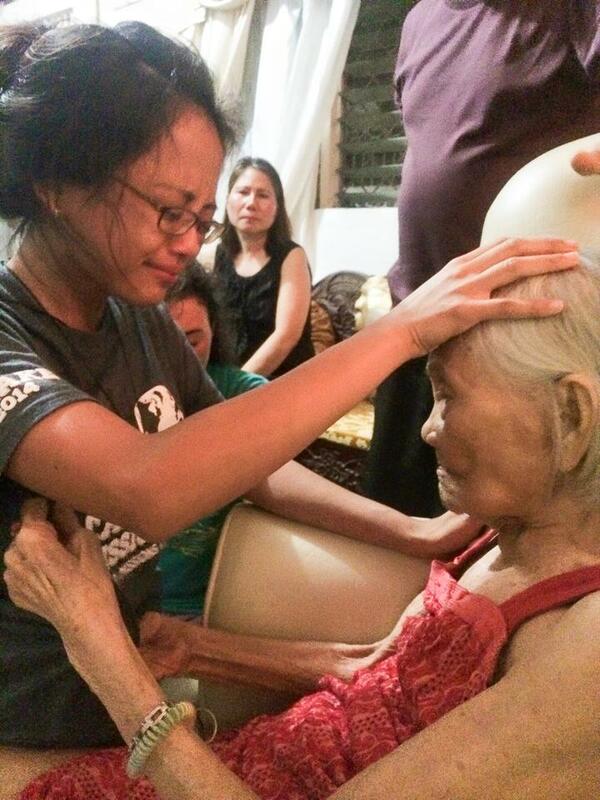 Joe, our priest, GOD LITERALLY CONCEIVED, PLANNED AND EXECUTED a trip for me to see my grandmother in Tacloban City. I didn’t even have to do anything except come along for the ride. It was in April of this year when my missionary sister and I found ourselves accompanying Fr. Joe and two others on a quest to find water for some communities in Samar province. Along the way to Samar is Leyte of which the capital is Tacloban City where my uncle and his family currently live. 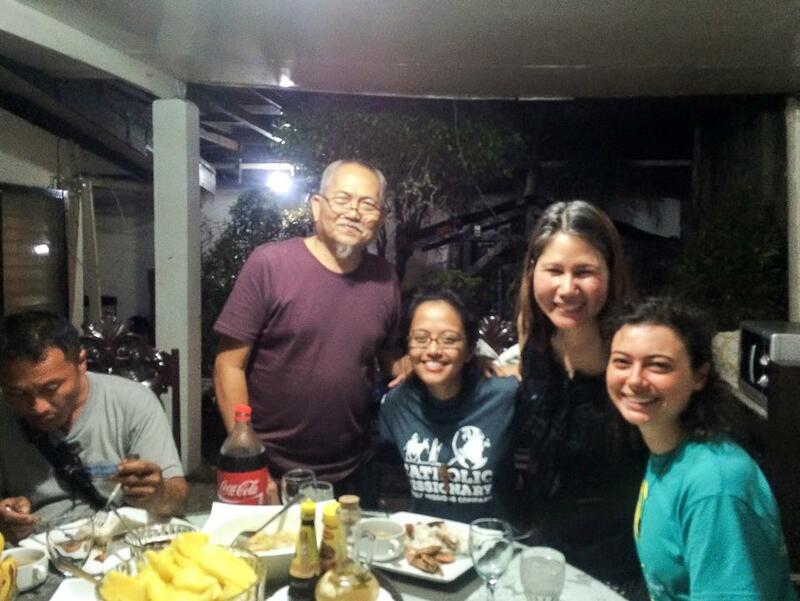 Father Joe had a jam-packed itinerary and so, not wanting to be an inconvenience, I was reluctant to ask if we could stop by Tacloban. 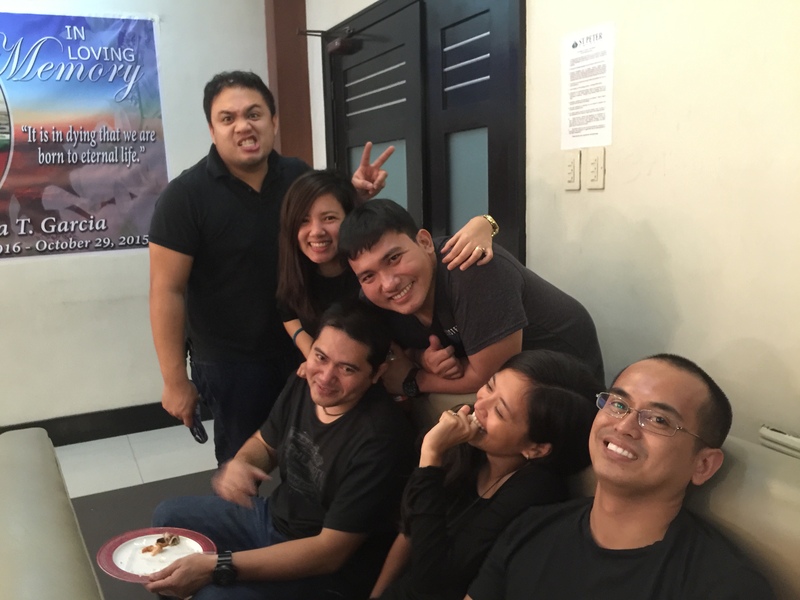 With my teammate’s persistent yet loving encouragement, I finally told Fr. Joe of Tacloban City’s significance to me. Without hesitation, he agreed to make sure we had time to stop there! From Camiguin Island, where I presently serve, to Samar is a very very long journey. At first, I thought we were only going to stop by my uncle’s house for a few short hours before we were on our way to Samar again. God surprised me, however: Not only did we drop by, but we also ate a bountiful dinner feast prepared by my uncle and his wonderful family. Afterwards, my companions and I were provided with a very comfortable place to spend the night since it was already evening when we arrived and it was still hours away to Samar. How incredible! Despite a very short notice, my uncle and his family gifted us with hospitality fit for the Trinity! God certainly takes care of his missionaries! Shortly after feeding us hungry travelers, my uncle brought me to my grandmother. Though excited to see her, I didn’t quite know what to expect because in recent years she had been suffering from memory loss due to her old age (98 years at the time of my visit) and could barely remember me. I had hoped that it would be different this time yet it was the same. Though painful, I was so happy to see her again after seven years. As I had intended to do for many years, I “offered up prayers and supplications, with loud cries and tears” for my grandmother (Heb 5:7). Together with my missionary sister, Rebecca, I begged the Lord to set her free from whatever ailed her in mind, body, and spirit, and to fill her with His peace. Even Fr. Joe joined in and gave my lola a special blessing. Afterwards, my grandmother still showed no sign of improvement, even resisting our help. It seemed that our prayers had no effect on her condition whatsoever. I felt discouraged. Early in the morning, right before we left, I decided to try once more. My uncle led me into the room where my grandmother still lay in bed. I sat beside her. 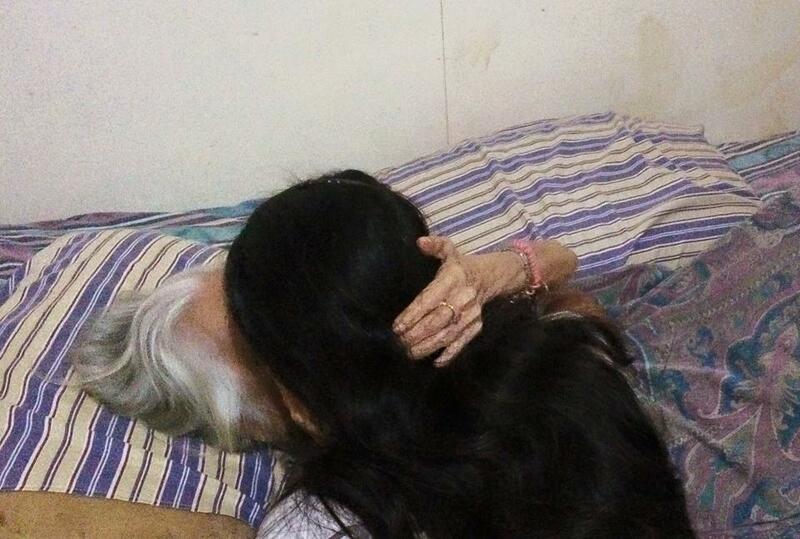 With only a few minutes left with her, God quickly worked a miracle: As I spoke to my lola, she was able to remember me. “Joan?” she asked.”Yes, lola,” I responded. Holding my face, not wanting to let me go, she added, “Is that you? I miss you… I love you.” For a brief moment, she remembered me and that was enough for me. “I will never see you again… I’m sad… I miss you,” she said a number of times. “Don’t worry, la. You’ll see me again,” I said to her as tears rolled down my face, not quite knowing when we would be the next time we would see each other again, yet believing that somehow God’s will is mysteriously perfect. Before saying goodbye, I hugged her once more as she lovingly kissed me as she had always done since my childhood. I was so grateful to God for that moment because it told me that He had heard my prayer. Although brief, I knew that what I had experienced was just a small glimpse of what God was/is doing with my prayers for my lola and my sacrifices as a missionary. 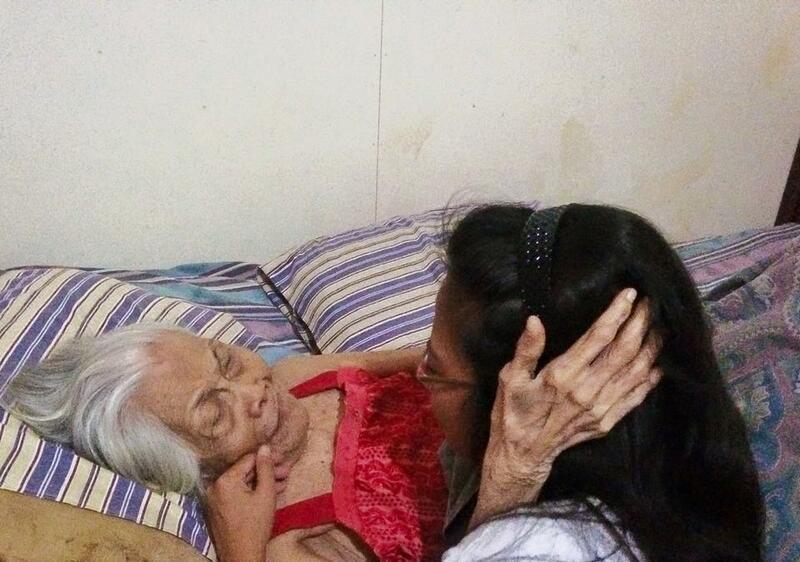 As I had expected, that would be the last time that I would see my lola. On October 24th, I received word that she had been admitted to the hospital and was in critical condition. With faith in God’s will, I prayed. When her condition did not improve days later, I asked the Lord what I should do as I was unsure whether I should hurry to see her or wait. On October 29th, I was at evening Mass which was preceded by a devotion to Our Mother of Perpetual Help. As I joined the people in prayer, God inspired me to think of how Mama Mary is with my lola in the hospital and how the angels are also in the room gathered around her at that very same moment. And as those thoughts came to mind, I believed them right away without question! After all, is that not what we ask Mama Mary each time we pray the Hail Mary – to pray for and be with us at the hour of our death?! Why then would our Mother fail us? Later after I received Holy Communion, I felt Jesus drawing close to me and embracing me as if to remind me that He cares about everyone who is precious to me including my grandmother. In His arms, I remembered that He loves me and that I need not worry for my lola. 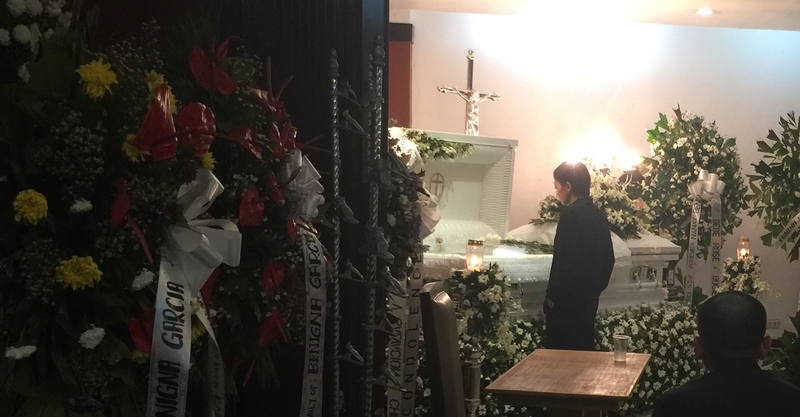 Two hours after Mass, I received the call from my cousin – my lola had passed away. Heartbroken, I started feeling guilty that I had not returned to Tacloban in time. Thankfully, God quickly protected me from these harmful thoughts and reminded of where I was during the critical hours of my lola’s life – I was in Holy Mass, the highest form of prayer and worship, interceding for my lola’s soul with Jesus, His Body and Blood, Mama Mary, all the angels and the saints before our heavenly Father. “A single Mass offered for oneself during life may be worth more than a thousand celebrated for the same intention after death” (St. Anself). I was exactly where I needed to be. 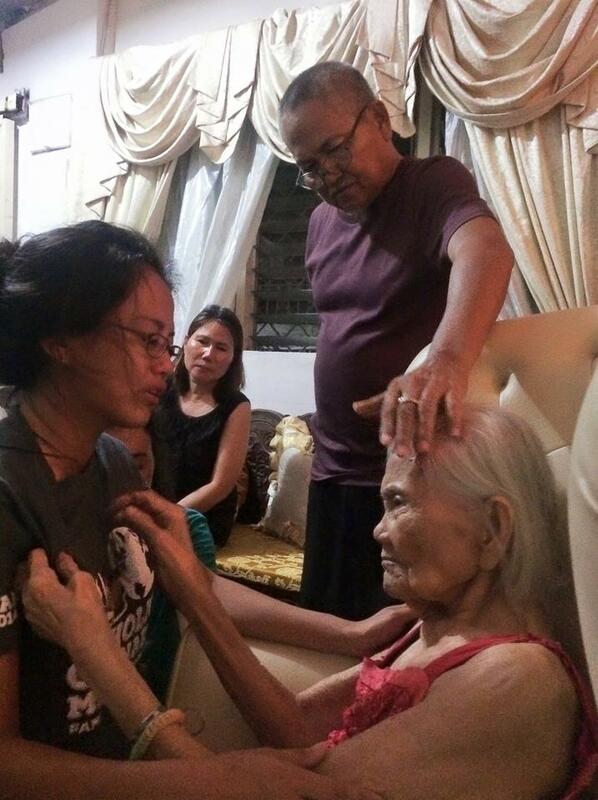 With my team’s loving support, I went Tacloban to say goodbye to my lola and be with my family including my dad and my aunt who traveled home to say goodbye to their mother. Providentially, the funeral services for my grandmother fell during the feasts of All Saints and All Souls. God is good! My brother and cousins also were present for these events. In the midst of tears, we found many opportunities to laugh as we recalled stories about our lola and about our childhood in the Philippines. 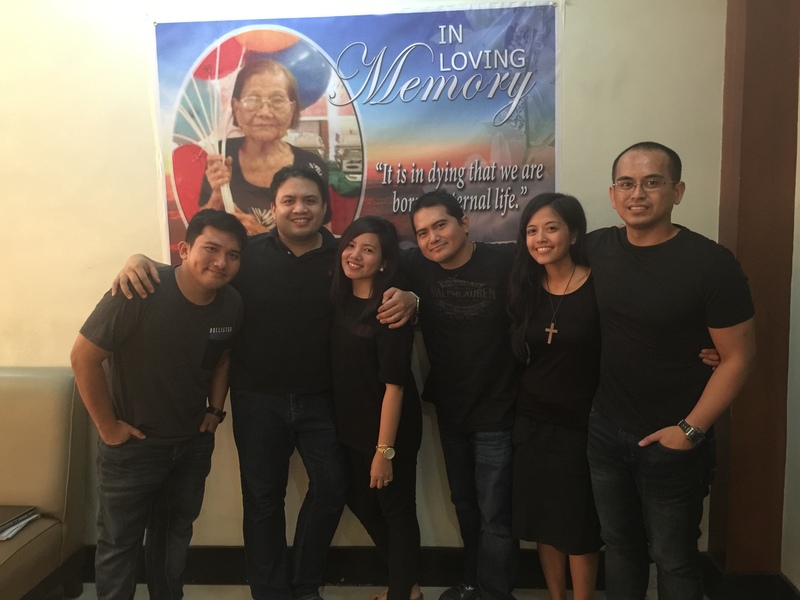 It had been years since we were all together but in our love for our lola, we found ourselves reunited again. In sending me to the Philippines, I think God was not only asking me to be his missionary to the poor but also to my very own family. Even at my lola’s funeral services, several times my family asked me, the missionary, to lead the prayers. How good of God to have called me to this place and during this time as His missionary. 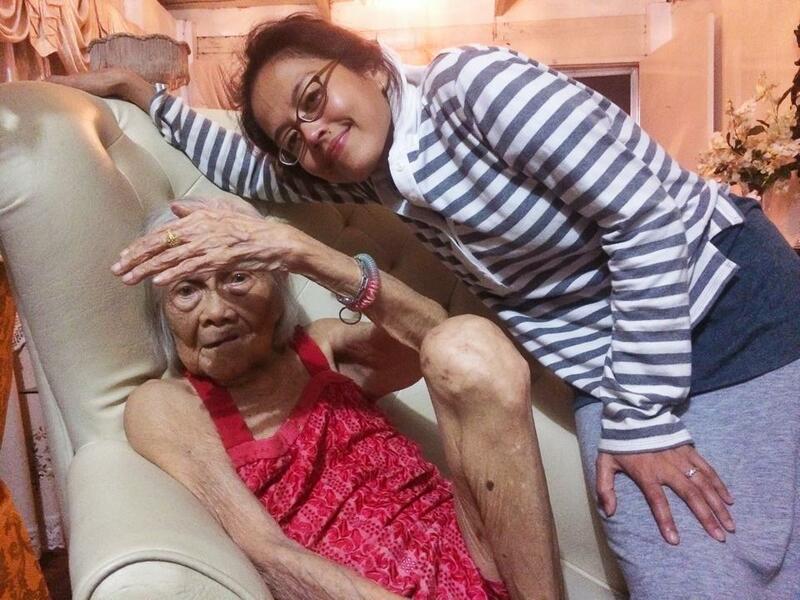 How providential that I am here in the Philippines and not in America during my lola’s final year on earth. How truly awesome is our God who loves me enough to give me this gift! When I said yes to foreign missions, I didn’t know where I would be sent. I knew, however, that the life I was choosing entailed sacrifices. With God’s grace, I surrendered to the idea of not being able to see my family and friends for an indefinite period of time. I trusted, believing somehow that God’s will is mysteriously perfect. And to my surprise, in saying yes to missions, I received more than what I gave up: God gave me the Philippines and, in effect, my family! This story is just one of the many stories of God’s faithfulness to me and the people I love while in missions. With His help, I want to share these stories and more with you in future posts. I love you, Lola. Thank you for inspiring me with my first post.